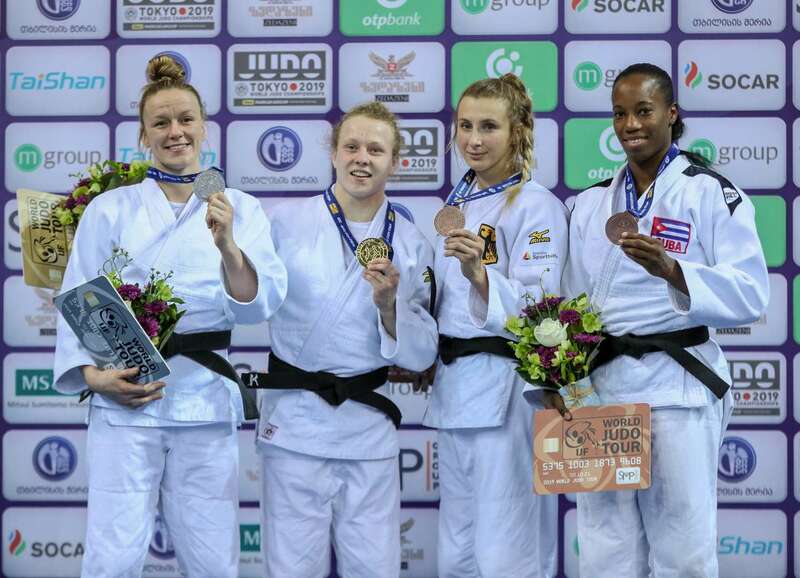 Junior World Championships gold medallist Sanne VERMEER (NED) earned her first senior IJF gold medal with a win over teammate and Marrakech Grand Prix bronze medallist Geke VAN DEN BERG (NED). VERMEER opened the scoring with a waza-ari and held down her international colleague for 10 seconds to wrap up gold in just 42 seconds. In the first semi-final VAN DEN BERG bested world number 21 Maylin DEL TORO CARVAJAL (CUB) by ippon while in the second semi-final Ekaterinburg Grand Slam silver medallist Lucy RENSHALL (GBR) fell to VERMEER from a te-waza movement in golden score. The first bronze medal contest was won by former European Games winner Martyna TRAJDOS (GER) after 21 seconds of added time as the German judoka threw with ashi-waza in the opening contest of the final block. The second bronze medal was won by DEL TORO CARVAJAL who narrowly saw off world number 23 Edwige GWEND (ITA) by a waza-ari score to win her first medal on the IJF World Judo Tour. 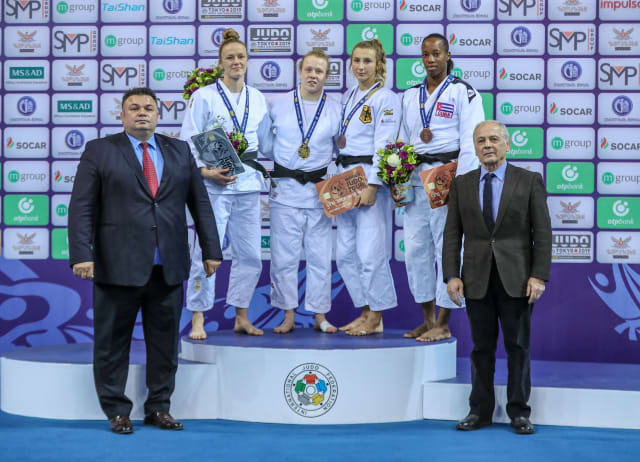 Paris Grand Slam bronze medallist Barbara TIMO (POR) continued her fine form for Portugal as she defeated Olympic bronze medallist Laura VARGAS KOCH (GER) in golden score. TIMO, who switched allegiance from Brazil to Portugal in January, outfought four-time Grand Prix winner VARGAS KOCH in golden score and the German judoka received her marching orders for her third shido. 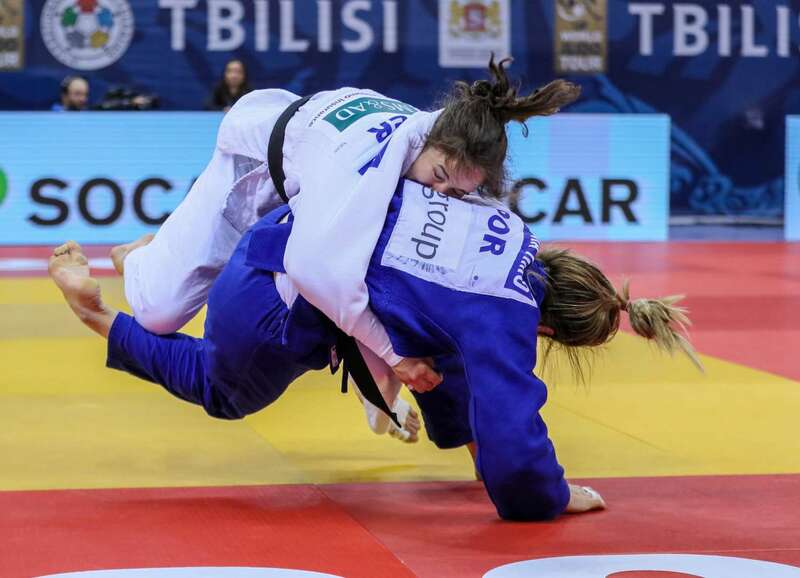 In the first semi-final VARGAS KOCH defeated former world silver medallist Maria PEREZ (PUR) with an o-uchi-gari after four minutes of golden score. 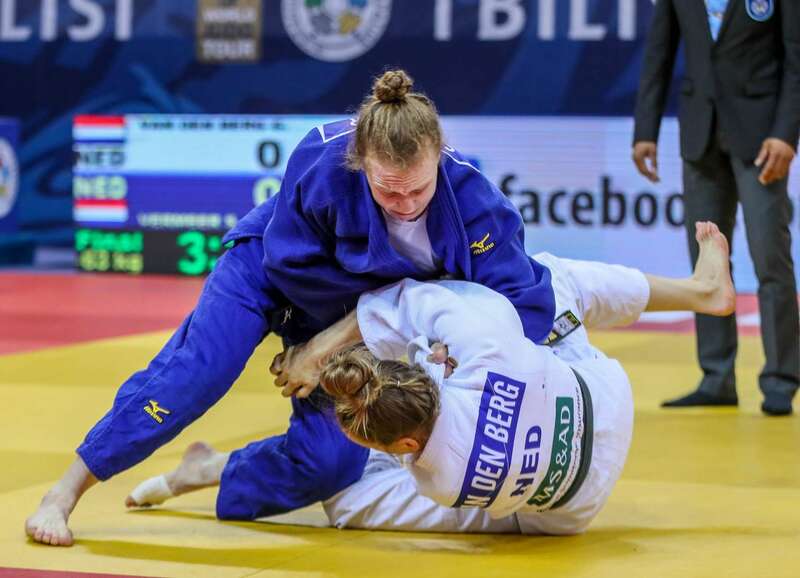 In the second semi-final former Ekaterinburg Grand Slam silver medallist Alena PROKOPENKO (RUS) fell to in-form TIMO by ippon after just 34 seconds. 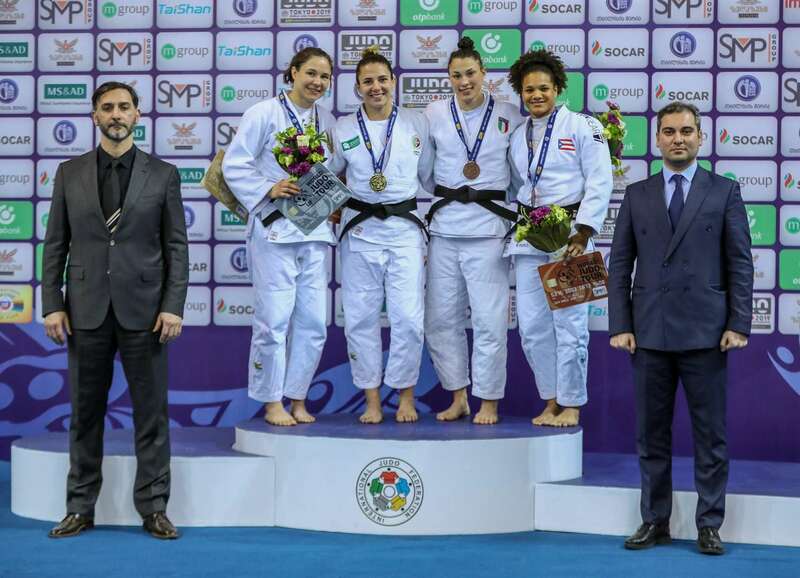 The first bronze medal was awarded to Junior World Championships gold medallist Alice BELLANDI (ITA) who went around the back of PROKOPENKO to take over the Russian for ippon with 80 seconds left on the clock. 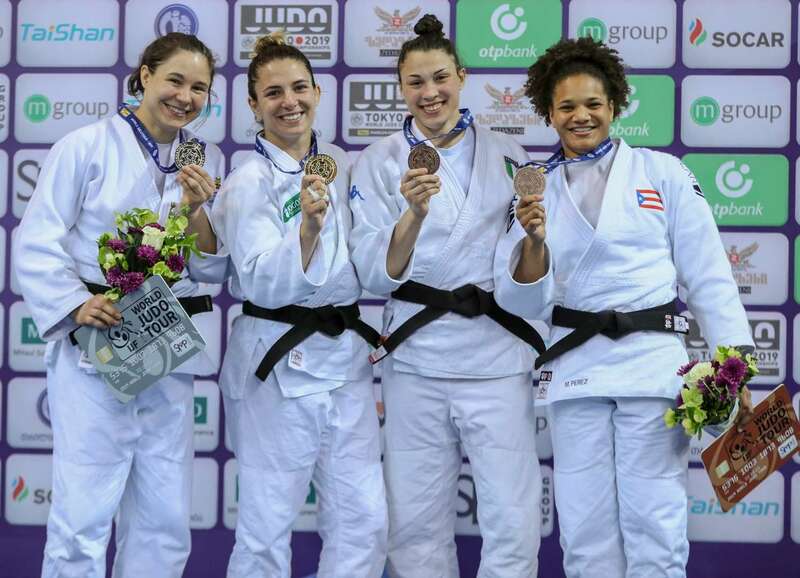 The second bronze medal was won by PEREZ who beat world number 50 Yarden MAYERSOHN (ISR) after 46 seconds by ippon for her sixth medal on the Grand Prix stage. 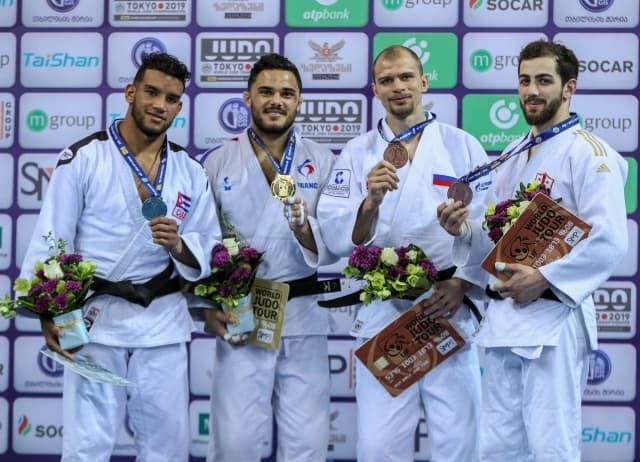 World number 43 Guillaume CHAINE (FRA) was a worthy but unexpected winner of the -73kg title in Tbilisi as he edged past former Havana Grand Prix silver medallist Magdiel ESTRADA (CUB). 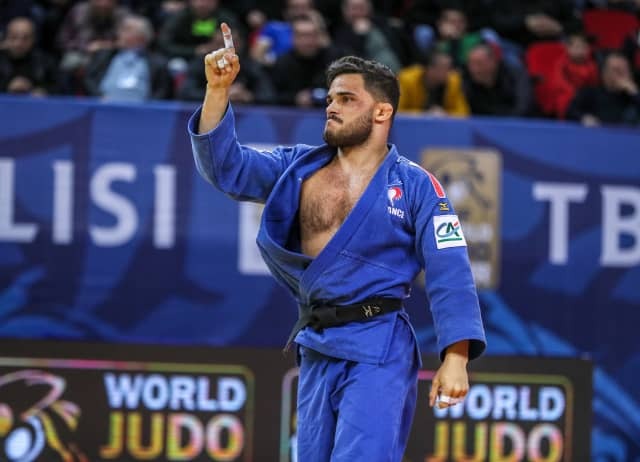 CHAINE won his first IJF World Judo Tour gold medal by scoring an o-uchi-gari after 29 seconds for a waza-ari and ESTRADA failed to impose himself in his first IJF final. France’s second gold medal in Georgia gave them top spot in the medal table after CHAINE disposed of Kazakh, Brazilian, Polish, Mongolian, Russian and Cuban opposition as he prevailed in all six of his contests. 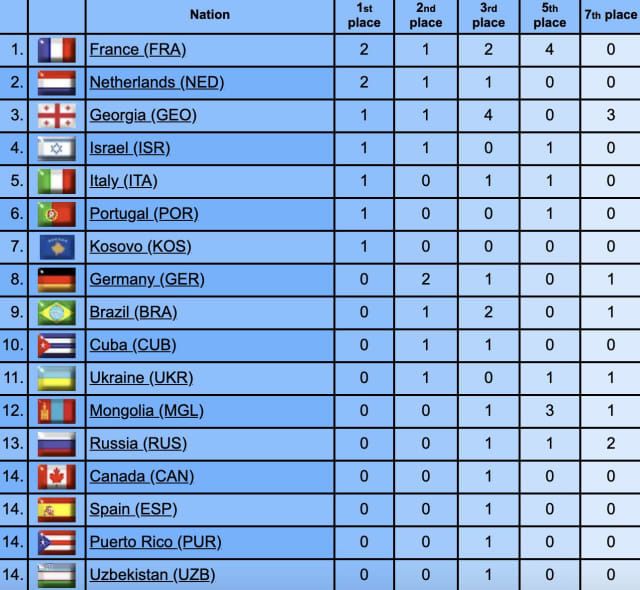 In the first semi-final ESTRADA (CUB) threw world number 397 Valeri IASHVILI (GEO) with a morote-seoi-nage for ippon. In the second semi-final CHAINE surprised Marrakech Grand Prix winner Denis IARTCEV (RUS) by throwing the Russian with 15 seconds left and then held down the latter for 10 seconds to reach the gold medal contest. The first bronze medal was won by IARTCEV who conquered Junior World Championships bronze medallist Georgios MARKARIAN (GRE) after 22 seconds with his patented ashi-waza. 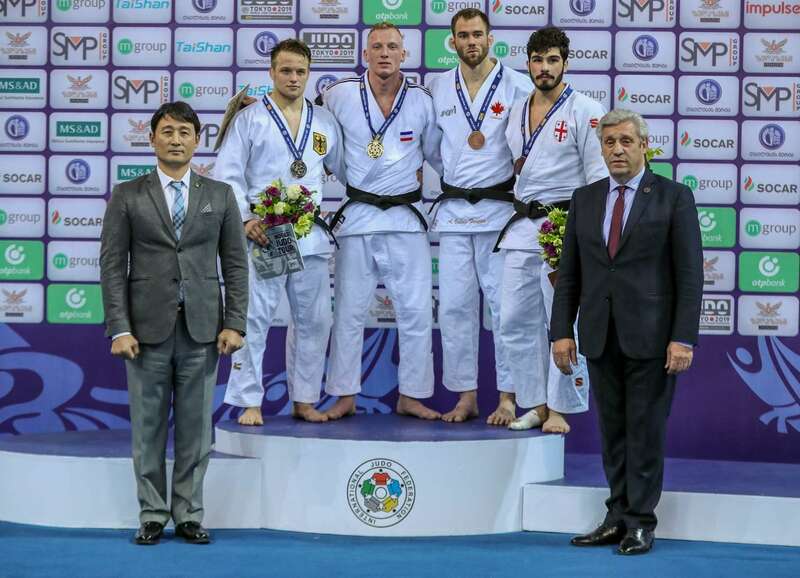 The second bronze medal went to IASHVILI who opened his IJF World Judo Tour medal account on his Grand Prix debut with a major scalp over former world bronze medallist GANBAATAR Odbayar (MGL). A tani-otoshi from the Georgian was the difference as the Mongolian had to settle for fifth-place. 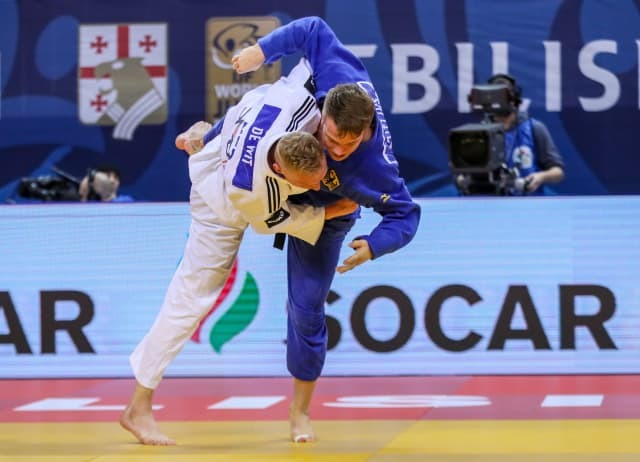 World Judo Masters bronze medallist Frank DE WIT (NED) won his country’s second gold medal of the day with a professional performance against number 108 Timo CAVELIUS (GER). DE WIT went for broke in early exchanges before settling down and establishing his dominance as first-time IJF finalist CAVELIUS struggled to threaten the Dutch star. Two-time Grand Slam winner DE WIT claimed his maiden Grand Prix title in golden score and in front of his parents when CAVELIUS was dismissed for a false attack which was his third shido. In the first semi-final DE WIT profited from a mistake by former Düsseldorf Grand Slam silver medallist Alpha Oumar DJALO (FRA) in golden score as the Frenchman lost his focus and pushed out his Dutch rival to receive this third and final penalty. In the second semi-final CAVELIUS snuck past 2018 Tbilisi Grand Prix silver medallist Anri EGUTIDZE (POR) by a waza-ari score to move into the final. 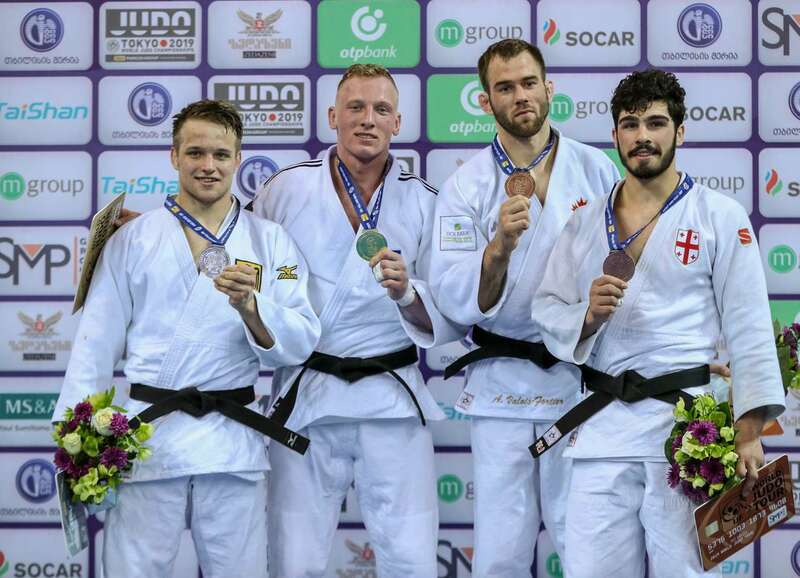 The first bronze medal was won by London 2012 Olympic bronze medallist Antoine VALOIS-FORTIER (CAN) who thwarted EGUTIDZE by a waza-ari score to claim his first IJF medal since he took gold at the Hohhot Grand Prix in 2017. 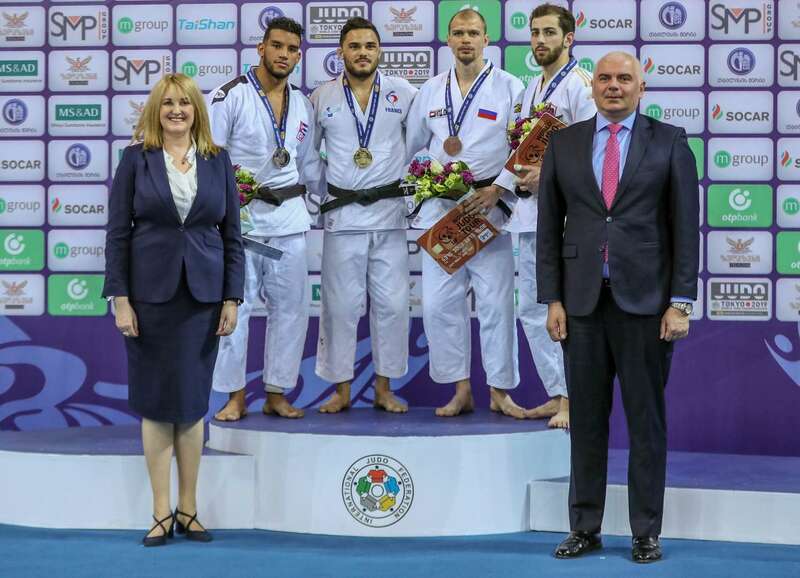 The second bronze medal went to 2018 Antalya Grand Prix bronze medallist Tato GRIGALASHVILI (GEO) who outlasted world number 46 DJALO after two minutes and 13 seconds of golden score by a waza-ari score from a ko-uchi-gari.